CrossFit.com has been posting a single Workout of the Day (WOD) on their main page since 2001. This seemingly innocuous act has snowballed into the most disruptive fitness movement the industry has ever seen. It has led to over 9,000 independently owned CrossFit® Affiliate Gyms, and over 200,000 competitors in the Sport of Fitness™. As far as we can tell, more people follow crossfit.com (AKA “Main Site” or “.com”) programming than any other single source of programming. It is the only official source of programming that is put out by CrossFit HQ. As such, we think it is very useful to analyze the characteristics and trends contained within the crossfit.com programming. It is worthwhile for followers of “.com” programming, as well as coaches who program for their gyms, to spend some time studying and researching these things. In 2003, Coach Greg Glassman, the founder of CrossFit, published a “Theoretical Template for CrossFit’s Programming“. In it he detailed some of the concepts behind his programming philosophy, and gave us a small window into his genius. For some people, the crossfit.com WOD seems to be somewhat of an enigma. Many have criticized the seeming “randomness”, “lack of structure”, and “lack of progression” in the programming. Some have suggested or insinuated that little thought goes into deciding what workouts, what types of workouts, and what order of workouts get assigned on crossfit.com. We categorically reject this notion, and can see a lot of deliberate thought and careful planning evidenced in the crossfit.com programming. On Beyond the Whiteboard, we’ve been entering in the “Main Site” WOD daily since we launched in 2008. In this series of articles, we will be analyzing various characteristics and trends found in the Main Site programming. In Part 1, we are looking at the programming based on Workout Modality. In Part 2, we look at Movement Selection and Frequency. In Part 3, we look at Workout Selection and Frequency. In this article, we will look at what Coach Glassman refers to as “Modality”. There are three different movement modalities in CrossFit: Monostructural Metabolic Conditioning or “cardio” (“M”), Gymnastics or Bodyweight (“G”), and Weightlifting (“W”). Categorizing movements by modality is one way to look at the balance we find in a WOD. A big part of the magic in CrossFit programming is the way these modalities are combined. To give an example, “Fran” contains Pull-ups (“G”) and Thrusters (“W”), giving it a “GW” modality. “Helen” contains Running (“M”), Pull-ups (“G”), and Kettlebell Swings (“W”), giving it an “MGW” modality. Looking at the graphics above, you can see that the most common modality assigned on crossfit.com is “W only”. A close second is “GW”. In fact, 71% of the workouts assigned on crossfit.com contain at least one weightlifting movement. 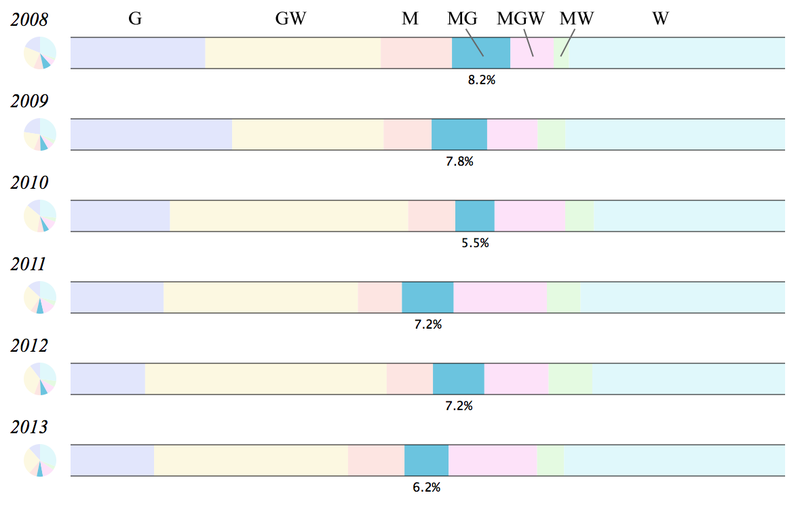 The least commonly assigned modality is “MW”, followed by “MG” and “M only”. Comparing the actual programming to the Theoretical Template linked above, we can see quite a bit of deviation. It’s worth reiterate that Coach Glassman stresses in the article that they do NOT base the crossfit.com on any set template. The crossfit.com programming evolves over time, and later we will look at how the mix of individual modality types have trended over the years. 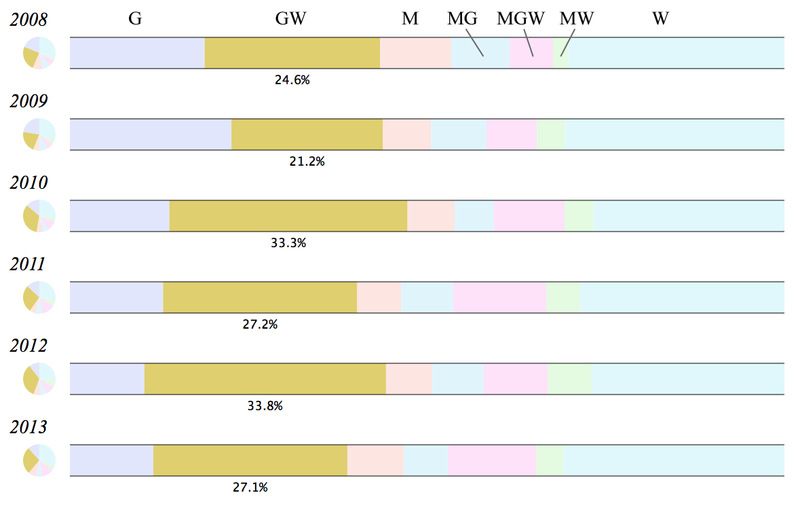 Below we can see the breakdown of single (“M”, “G”, or “W”), double (“MG”, “MW” or “GW”), and Triple (“MGW”) modality workouts. Single modality workouts are most commonly prescribed, followed closely by double modality workouts. Triple modality workouts are seen less than 10% of the time. Over the years, we have seen different trends in the crossfit.com programming. Some years certain modality combinations were featured heavily, while others were neglected. I imagine some of this was intentional, and some of it can be chalked up to “constantly varied”. Below we will look briefly at each modality combination, broken down by year. In 2008 and 2009, we can see “G only” accounting for roughly 20% of the workouts. By 2012-2013 it has fallen to roughly 11%. In 2008, “M only” accounted for 10% of the workouts. From 2009-2012 it hovered around 6%. In 2013, we saw it jump back up to almost 8%. “W only” has hovered around and below 30% for the entire period. We see a roughly 3% drop-off from 2010-2012, but it was the highest every in 2013 at 30.9%. “W only” has always been a prominent modality in the programming. It was only overshadowed by “GW” in 2010 and 2012. “MG” has hovered around 7% throughout this entire period, with a low of 5.5% in 2010 and a high of 8.2% in 2008. In 2013, we saw a 1% drop to 6.2%. “MW” started in 2008 at 2.1%, and then slowly grew to a peak of 6.1% in 2012. In 2013 we saw a reversal in the trend, and it dropped back to 3.8%, its lowest level since 2008. “GW” has varied quite a bit over the years. Its lowest share was 21.2% in 2009, and its highest was 33.8% in 2012. In 2010 and 2012, it was the most prescribed modality. 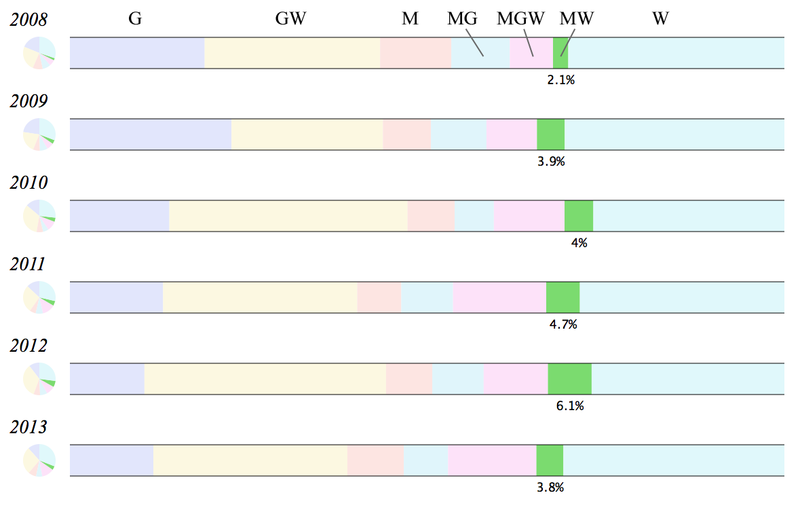 “MGW” grew steadily from 2008-2011, where it peaked at 13%. It dropped to 9% in 2012, and recovered in 2013 up to 12.4%. Hopefully you were able to glean some interesting insights through our presentation above. Keep in mind that modality is just one piece of the puzzle. In future articles we will be looking at movement selection and frequency, as well as other characteristics such as workout duration, rep ranges, and loading. Be sure to subscribe to our newsletter at the bottom of this page if you want to be notified of the next installment. In the meantime, good luck with your programming! Would gratefully accept any help with my Box programming.